Windows Phone 7 is finally here with a UK release date of 21 October. Here we look at the handsets that will be hitting UK phone stores on that date or later in the year. Windows Phone 7 phones have internal storage like the iPhone – and like Apple's handsets there's no microSD expansion either. All Windows Phone 7 handsets also have touchscreens – part of the 'Chassis 2' specs which Microsoft has laid down for all Windows Phone 7 handsets. All also have a 1GHz processor, a 1500mAh battery and Bluetooth 2.1, along with a 3.5mm headphone jack. First up is the HTC HD7 – which is the biggest of the phones on offer, bringing a whopping 4.3-inch 800 x 480 screen, powered by the 1GHz Qualcomm Snapdragon processor with 16GB of storage (though an 8GB version is also being produced, it doesn't seem like the UK will be taking it). It matches the dimensions of the popular HTC HD2 and forthcoming HTC Desire HD - size wise it comes in at 122 x 68 x 11.2 mm, and weighs 162g. A 5MP camera with dual LED flash is stuck on the back, which is also capable of recording 720p HD video. There's also Dolby Mobile and SRS Surround Sound too. 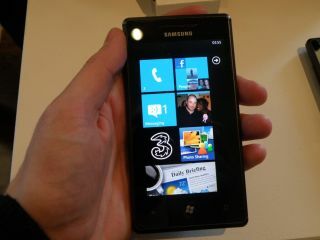 This phone is being offered by just O2, who have picked up the exclusive rights to a handset which is likely to be among the most sought after of the Windows Phone 7 handsets. The HTC 7 Trophy offers close to the power of the HTC HD7 with a 1GHz Qualcomm Snapdragon processor but it's smaller, with a 3.8-inch touchscreen. It weighs 140g, with dimensions of 118.5 x 61.5 x 11.96 mm. Internal storage comes in at 8GB. There's also a 5MP camera with LED flash and 720p HD video recording, Dolby Mobile and SRS Surround Sound. The Trophy will be available exclusively on Vodafone to begin with – the HTC 7 Trophy UK release date is 21 October and it will be available on £25-a-month contracts. The HTC 7 Mozart is a 3.7-inch touchscreen phone that is being offered exclusively by Orange in the UK – it has a UK release date of 21 October. It's very similar to the HTC 7 Trophy but the key difference is that it's aimed at people who want a better digital camera – there's a 8MP camera with Xenon flash on the back. However, the screen is a touch smaller at 3.7-inches though the resolution is still WVGA (800x480). The HTC 7 Pro packs in a full landscape QWERTY keyboard, and 16GB of internal storage. There's a 1500mAh battery on board as well, which is larger than the HD7, Trophy or Mozart, so 'productivity on the go' is the key message here. It also offers a 5MP camera with LED flash and 720p HD video recording, Dolby Mobile and SRS Surround Sound. However, it's not exactly lightweight, with dimensions of 117.5 x 59 x 15.5 mm, and weighs a fairly hefty 183.5g with battery. Vodafone is offering the LG Optimus 7 which brings a 3.8-inch WVGA capacitive touchscreen, 5MP camera with LED flash and 16GB of onboard memory. Like other Windows Phone 7 handsets, the Optimus 7 can also record in 720p HD, and also comes with a digital compass too. Another LG handset was also rumoured with a slide-out keyboard – we're actually likely to see a QWERTY model around Christmas in the guise of the LG Optimus 7Q, known as LG Quantum in the USA. The Samsung Omnia 7 (model GT-I8700) features a 4.0-inch Super AMOLED touchscreen (whoop), Bluetooth 2.1, Wi-Fi and A-GPS connectivity. There's also a 5MP camera and 8GB of internal storage. The device runs on Qualcomm's 1GHz Snapdragon chip and a whole host of connectivity, including: Bluetooth 2.1, Wi-Fi 802.11n and A-GPS. The Samsung Omnia 7 UK release date is 21 October and Orange will be offering it at a rather expensive £40-a-month on a 24-month contract. This Dell handset has a UK release date of Christmas and will feature a slide-out QWERTY keyboard. Specs wise, the Dell Venue Pro offers a 4.1-inch touchscreen and the 1GHz Qualcomm Snapdragon processor along with a 5MP camera and a rumoured 8GB of storage. Expect the handset to be available direct from Dell as well as a handset partner – much like the Streak is available direct from Dell and also through O2.